Though I said on Sunday that we would meet "rain or shine" tonight, that was before the newly forecast 100% chance of thunderstorms for tonight. If it had just been rain, we would have been fine in the pavilion but we're not going to take the chance with thunderstorms rolling in. Therefore, tonight's den meeting is cancelled. Unfortunately, I will be unable to reschedule for any other time this week so we're going to have to try to squeeze the last few requirements in next week. The boys listed below have a chance to complete the Webelos badge by next week but only if a couple of things can be done at home. 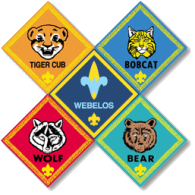 Linked , please find two documents that need to be done at home by next Tuesday to complete the Webelos badge in time for the crossover on that Saturday, June 7. Guide to Protecting Children from Child Abuse: This document contains material that is too sensitive for us to discuss in a Webelos meeting. As prescribed by the BSA, it should be done at home between the scout and his guardian. Hint: I only need you to tell me it's been done. 7-Day Meal Log: This is a very simple 7-day meal log which helps the scout to keep track of the meals he ate in a given week. Please complete this to the best of his recollection and don't worry too much if he missed logging a meal or two. Lastly, especially for the families listed above, please let me know if Monday June 2 or Tuesday June 3 is better for you. If we can move it to Monday, June 2, I have a chance at getting the NGRC as a fallback in case of bad weather. Thanks.